Equipment: Tape measure, 12’ piece of plastic conduit, string line, circular saw, and tape measure. Key Question: How do I install a scallop? How do I install a scallop? Whether it is an overscallop or underscallop, the technique for cutting a scallop is the same. Scallops generally reflect an 8” deflection overall. If doing an underscallop, locate the center of the bay between the posts. Mark an 8” drop at this location. If doing an overscallop, mark an 8” drop at each post location. 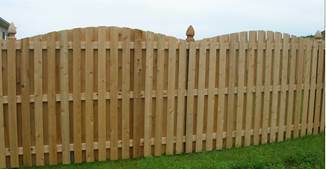 If doing an underscallop, place your conduit at the top of the fence. Fix it at the top of each post and then apply pressure that forces the conduit to flex and drop between the posts. Keep applying pressure until the flexed conduit reaches the 8” centerline drop mark. If doing an overscallop, place your conduit 8” below the fence height at each post location; apply pressure so that the conduit flexes upward to reach the fence height at the center of the bay. Holding the conduit in-place, run a pencil along the conduit, marking the radius (overscallop or underscallop). With the scallop etched on the wood, use your circular saw to cut the scallop. A 10” circular saw is helpful when cutting a board-on-board scallop. You may have to use a saw-zal to trim the scallop at the post to avoid cutting into the post.